I had the pleasure of meeting Officer Matt Friedman of the Park Station District at the bike theft prevention workshop he helped organize last December. He’s been serving with the San Francisco Police Department for about 6 years and recently created a Twitter account, @SFPDBikeTheft, to encourage more dialogue between the SF cycling community and the SFPD. At a time when there’s been a great deal of criticism aimed at them, Officer Friedman is showing how social media can provide an open conduit for communication between citizens and local enforcement — and can go a long way in improving the public’s perception of them. 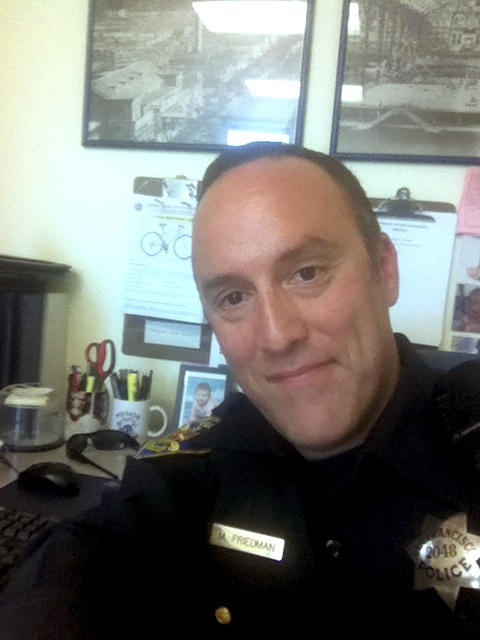 Under Officer Friedman’s management, several successful citizen-driven actions have resulted since the Twitter account’s launch in late July; tips from users have led to the closure of a chop shop, halted a recent attempt in the Mission to steal a Bay Area Bike Share bike, helped return a touring bike to a visiting student and factored into the arrests of bike thieves. Officer Friedman took some time out from his busy schedule for a brief interview with me via email. You’ve taken a special interest in cracking down on bike theft in San Francisco and the Bay Area. What prompted you to devote so much time to this problem? As an avid cyclist, I can identify with victims of bike theft. I also believe that a biker-friendly city has to have a high level of theft enforcement in order to support green initiatives and healthy lifestyles. Lastly, I don’t want to see thieves get away with giving bike riders a sense of hopelessness. We can do something about this if we work together. Why did you create the Twitter account, and what are some of benefits and drawbacks of creating the account? I think Twitter has been a great tool to get information out quickly about bikes that have been stolen, recovered bikes, tips and suggestions on how to protect your bicycle against theft. I think it’s important to know the faces of the people who take them. Thieves think that they can operate autonomously. I am hoping to change that perception which will ultimately benefit the community. I think the Twitter account has tapped into a very unique resource. Bicyclists have a way to report thieves and help the SFPD send them to jail. Prior to starting the account, I wanted to try and respond in real time as much as possible so the account becomes reliable and dependable for the cycling community. Too many times I see twitter accounts that have large gaps from post to post. I wanted to make this account so people can interact with a police officer within a short time frame. But I find myself tweeting off duty more and more because I don’t want to let things slip by….. When should individuals call the non-emergency number (415-553-0123) or 911? For crimes in progress, you can always call 911, and bicycle theft is always worthy of 911. For chop shop issues, please call the non-emergency number. I realize this could be a hassle because of potentially long hold times for the non-emergency number, but calls for service help determine future operations. It’s important! Why are chop shops so hard to stop? These chop shops are springing up all over town and usually correspond with homeless encampments. Almost all of the serial numbers the officers run come back with no record on file. If nothing is on file, then we can’t prove that the frames are stolen. It’s imperative that people [who’ve had a bike stolen] to file a police report and include the bike’s serial number. Officers are using other tactics such as quality-of-life enforcement to try and resolve chop shop-related issues. What can you tell us about the SFPD’s usage of bait bikes? We are getting better and better at conducting these types of operations. We are not just going after street-level thieves with this but are looking at the bigger picture. So far, so good! Bike theft (and reports of theft from residents) have increased in recent years. What are some basic things cyclists should do to prevent their bicycles from being stolen? Locking techniques are a key component in stopping bike theft. Learn the right way to lock a bicycle, always lock up in your garage and have your garage inspected by security professionals to point out weak access points. Consider installing surveillance cameras which have helped us tremendously in recent years. Don’t leave your bicycle in your locked vehicle thinking it’s safe and don’t leave your bicycle locked outside overnight. What do you hope will happen in the future to help with the bike theft problem? San Francisco SAFE and the SFPD will be rolling out a citywide registration program in the near future coupled with educational workshops that discuss locking techniques, investigations and security issues. The SFPD is taking bike theft very seriously and I believe we are only going to get more aggressive in confronting the problem. But this is not an enforcement effort alone. I believe the solution to this problem will be a partnership between law enforcement, the community and our political leaders in making changes that works for everyone.